If you are looking for the technical details of our HSMM-MESH™ nodes and/or the firmware, go straight to the User Documentation. Otherwise, here are some papers, presentations and reference files that cover info about HSMM-MESH™. If you are looking for other web sites on the HSMM topic, please use the Web Links menu option on the front page. Videos are now under the Video link in the HSMM-MESH Info menu. August 2010, Austin, TX Summerfest presentation on HSMM by Glenn Currie, KD5MFW in a PDF document. August 2009, Lucas, TX (Dallas/Plano area) presentation on HSMM by Kipton Moravec, AE5IB. This is a large PDF file at 15.3 mb. February 2010, Lucas, TX (Dallas/Plano area) presentation on HSMM by Kipton Moravec, AE5IB. This is a large PDF file at 29.5 mb. Hamcom 2009 Presentation by Glenn Currie, KD5MFW in a PDF document. Hamcom 2009 Presentation by John Champa, K8OCL in a PDF document. Hamcom 2010 Presentation by Glenn Currie, KD5MFW in a PDF document. This is a large PDF file at 11.5 mb. 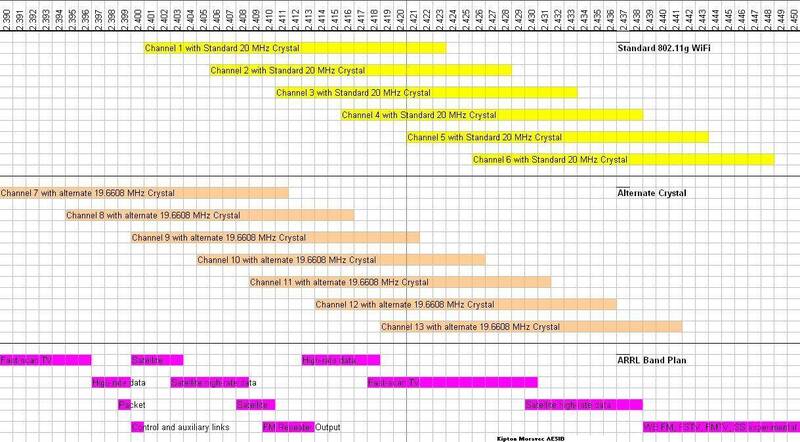 Kip AE5IB's Band Plan showing ARRL plan, stock crystal, and slide-band modification.